Enjoy afternoon sun on the back deck! Come enjoy this sunny and spacious 4 bedroom cottage fully equipped with new amenities just steps to Fox Island Marsh and Pilgrim Spring Woodland Conservation Area and Trails. A stay at Blackfish Cottage provides spectacular walking trails along the bay and nearby woodlands. Recently updated for the rental season, Blackfish Cottage provides all the amenities needed for a restful and memorable stay: a spacious deck perfect for cocktails and sunsets, modern kitchen and baths, flat screen SMART TV for rainy days, new Weber gas grill, outdoor shower, and a huge back yard for the kids. Situated on a quiet road, this home allows you to enjoy privacy and picturesque environs yet a short walk to the bay for kayaking or a quick swim. 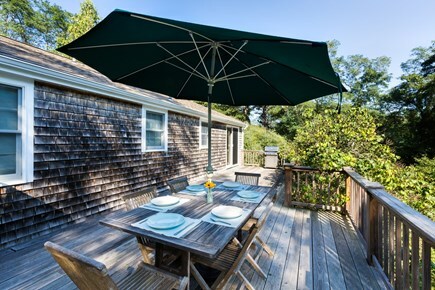 The house is conveniently located with just a five minute car ride to most bayside and oceanside Wellfleet beaches, the town center, golfing, tennis, and the head of the bike trail. Blackfish Cottage is also convenient to Route 6 which will take you to the best bakeries in town in five minutes and Provincetown, the National Seashore Center, and Orleans beyond. Additional availability info: Blackfish Cottage is available for Fall, Thanksgiving, and Christmas getaways. Call owner directly. This is a Saturday to Saturday vacation rental. Long-Term Rental (1 month or more): If you are looking for a long term winter rental please call Sarah directly at 617-230-1413 to discuss pricing and availability. Additional pricing info: Cleaning fee is $250.00. Pet fee is $250.00. Bed Linens and Bath Towels Package is $250.00, State and local taxes of 12.45% will apply. Three bedroom, two bathrooms, kitchen, living room and deck are all accessible from the first floor. We returned for our sixth consecutive year to this well maintained and comfortable cottage.Close to ocean beaches and ponds makes it ideal for family activities.We love having dinner on the deck and taking nature walks on the nearby conservation lands.Our family has so many wonderful memories here and wouldn't want to stay anywhere else. We had a fantastic family vacation in your cottage. It was stocked with everything we could have asked for and every detail was taken care of. 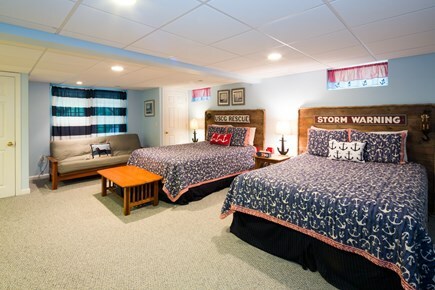 The decor and feel of your home was perfect for a relaxing stay on the Cape. Thank you for allowing us to share this beautiful place and for setting the stage for a perfect vacation! This rental home was perfect. We stayed for a week in early September of 2016 and enjoyed great weather and easy access to several beaches nearby both on the ocean side and the bay side as well as local restaurants and shopping. The hiking trails in the neighborhood were lovely, and the boat launch area nearby for our kayaks made it extremely easy to get out for a paddle. The floor plan was laid out well for us and a variety of visitors including both family and friends and one elderly with a walker that found it easy to enter and get around. The comfortable furniture and beds throughout along with laundry in unit made for easy living and included a large sunny rear deck that was great for summer entertaining. The home itself was well equipped with everything you would need and truly felt like a home away from home with extras for relaxation on vacation. The owner Sarah was very nice, resourceful and provided clear instructions to make the arrival and departure a breeze as well providing any information about the home and the area during our stay. Our family loves this beautiful, well maintained, and comfortable home! We return year after year with our granddaughters (ages 4&6). Walk out to the nearby marsh trails for spectacular views or take an easy drive to beaches and ponds. Staying at Blackfish Cottage was a pleasure - what a peaceful location. I especially loved the proximity to all the marsh trails, of which my family took full advantage. We also appreciated how clean the house was. Your house proved to be everything we expected. It was so great to be able to step out the front door and simply WALK without getting into a vehicle; the expanse of green alternating with the water is so soothing to the eye. All in all, a touch of magic! Staying in your Wellfleet home was most enjoyable and I would recommend it to anyone looking for a special place to stay in that area. We had a wonderful family vacation in your home. Thank you so much for all you have done to make it a special place, where others can feel comfortable and enjoy the Wellfleet area! We found everything we needed. But the most important feedback I have is that you have done an extraordinary job in setting up a welcoming vacation home, and we are incredibly appreciative of all the hard work that goes into that. Thanks so much for the gift you have given our family! such care of their home and who furnishes it so beautifully. " ""We loved your beautiful, peaceful, relaxing and kid friendly home." The owner has been renting her bayside cottage for over a decade now to tri-generational families near and far. She prides herself on offering welcoming and immaculate accommodations, with a fully stocked kitchen for cooking, and beautifully appointed bedrooms. No hand me down furniture or beds in this home! The home comes fully equipped so hard-working parents need only pack a suit and clothes! The rest is provided on site for you! In addition to offering an immaculately furnished light filled home that immediately puts you in the beach mood upon opening the door, what is most special about the property is its location abutting acres of conservation land that includes woods and beach. There is nothing better than rolling out of the house in the morning for a walk to the marsh and beach a short five minutes away! Take in the ever-changing tide, the salt air, the wildlife on the marsh, and the light for which the Cape is famous. Repeat the walk just before sunset before cocktails on the deck and a grilled dinner. Does not get better than that! Well fleet is a very special town because it is filled with some of the most beautiful bay and ocean beaches on Cape Cod, not to mention several kettle ponds that are marvelous for kids of all ages. Bring along a kayak or a canoe for hours of fun!